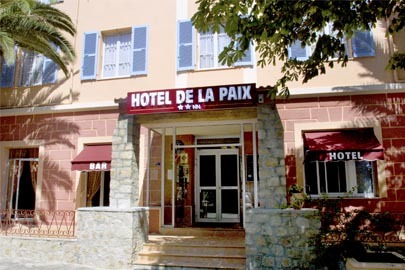 he Hotel de la Paix is situated at the end of the Padoue Square,calm and central only 100 metres away from the main Paoli Cours which is the principal road in Corte. A huge rock building, this was constructed in 1932 owned by the Casanova family and their children who come from a long line of hotel keepers.In 1973, the hotel was expanded and in 1999 it was entirely renovated. There is a family atmosphere and a large room availability since this family run hotel is closed only 15 days for the end of the year holidays. The hotel has 63 rooms with TV.,telephone,shower/bath and W.C. There is a bar, living area with TV. and a restaurant,(open from april to October) that offer you a variety of services at very affordable prices. The hotel is at five minutes away of walking distance from the old city and the Corsican Museum, very near the departure area for Tavignano and the Sega refuge. The car parking is relatively easy with the town parking 100 metres away and private parking 50m away.